An illness is challenging in itself, however, those suffering from mental illness are doubly challenged. Aside from the symptoms of their ailment and the disabilities resulting thereof, they also have to deal with the stigma of their disease. Consequently, mental illness sufferers rarely reach the levels of quality of life that they deserve. These stereotypes are most common in the case of mood disorders, particularly bipolar disorder. Overcoming this stigma and repositioning a patient on the path towards recovery is difficult, however, with the proper psychosocial management of bipolar disorder, this task can be achieved. In other words, bipolar disorders represent a type of mental illness presenting with severe mood swings, ranging from depression to mania. Because of these often unforeseen mood swings, bipolar disorder causes risky behavior, including suicidal tendencies. Treating this illness seriously is paramount for patients to have a chance of regaining their normal lives. Most patients experience the first symptoms during their teens, early 20’s or 30’s. The deciding element is represented by the occurrence of manic episodes. While Bipolar I Disorder is defined by the patient’s experience of at least one manic episode and usually depressive episodes, Bipolar II disorder is defined by the absence of a full-fledged manic episode, despite the presence of major depressive episodes with at least on hypomanic episode. If bipolar features don’t meet the specific diagnostic criteria, the patient is most likely suffering from unspecified bipolar disorder. Though health experts haven’t come to a consensus as to what causes bipolar disorder, there are certain factors that have been tied to its occurrence. There’s a genetic component incriminated in the appearance of bipolar disorders. Certain neurotransmitter imbalances (serotonin and norepinephrine) are also considered to be involved, as are psychosocial factors and drugs. Bipolar disorder sufferers experience symptom-free periods that alternate with episodes of symptoms. Though the duration of these episodes varies, they generally last between a couple of weeks to 3 or 6 months. 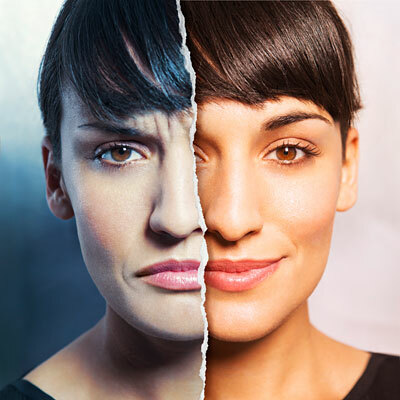 So how can you recognize bipolar disorder and what are its signs and symptoms? Behavioral changes (patients are often easily distracted, they undergo multiple and new activities, they talk particularly fast, jump from idea to idea, lack proper concentration, have racing thoughts, they engage in risky behavior, act impulsively, experience unrealistic confidence in themselves and their abilities, cannot sleep or don’t wish to do so, don’t feel tired and are overly restless). A manic episode differs from one person to the next. They end more abruptly than a depressive episode and generally don’t last as long. Patients experience feelings of exuberance, elatedness or feel irritable. They exhibit unusual self-confidence, dress extravagantly and pursue unusual activities such as gambling, risky business projects and even dangerous sexual behavior. Behavioral Changes (patients experience extreme tiredness, concentration issues, memory issues, they are unable to make decisions, they experience suicidal thoughts, change their eating and sleeping habits and are often irritable or restless). The issue with bipolar disorder is that it’s difficult to recognize, especially if the patient isn’t experiencing episodes of mania but rather, episodes of hypomania. This is a less severe form of mania and often results in extremely productive behavior. Patients rarely notice that there’s anything wrong. It’s usually the family that notices the mood swings. There are also mixed episodes, when a patient’s emotional state is so instable that they can burst into tears amid elation or they may fall asleep depressed and wake up energetic and elated. The issue with mixed episodes is that they involve a particularly high risk of suicide. Consequently, patients need to be carefully monitored. There is no bipolar disorder test to definitively diagnose a patient suspected of suffering from this ailment. Consequently, psychiatrists base their diagnosis on a set of distinctive symptoms. This, however, creates a myriad of issues, particularly because of the fact that patients experiencing manic episodes rarely relate any symptoms. They simply don’t recognize that there may be something wrong. 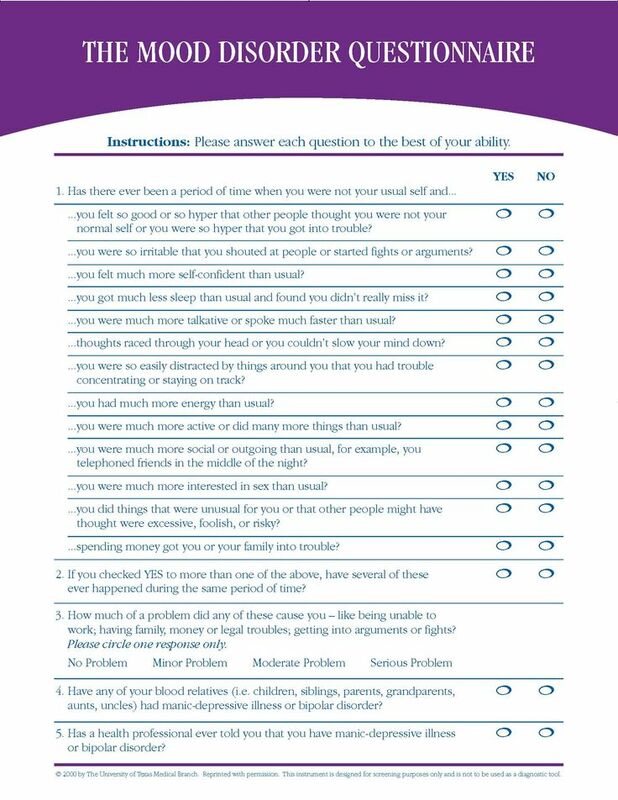 Certain mood disorder questionnaires can be used to evaluate a person’s current state and point towards a mood disorder, if one exists. Depending on how severe symptoms are, patients may require hospitalization, especially in the case of extreme manic episodes. Treatment involves a combination of mood stabilizing drugs, antipsychotic drugs, antidepressants, anticonvulsants in some cases as well as psychotherapy. For patients suffering from depression that isn’t relieved through medication alone, electroconvulsive therapy may represent a viable option. Among mood stabilizers, lithium is one of the most common choices, especially because of its ability of preventing mood swings. Lithium requires approximately 4-10 days to take effect, so additional antipsychotics may be required during the initial period. Your doctor will find the ideal combination of antipsychotics, antidepressants, and mood stabilizers. After the initial treatment phase, when patients become stabilized and get their symptoms under control, continued treatment needs to be addressed. Patients require lifelong treatment to ensure that symptoms don’t recur. Education is an essential part of the treatment process. Learning about their condition can help patients stay motivated and respect their treatment plan. Countless non-profit groups offer support and help patients stay on-track. At the same time, focusing on healthy activities and hobbies may help patients have a better outlook on life and the condition they’re dealing with. Stress management and relaxation techniques are also a valuable asset and should become part of a patient’s daily routine. Researchers are also making progress where bipolar disorders are concerned. A recent study published in the British Journal of Psychiatry highlighted a connection between patients with an identified genetic propensity of developing bipolar disorders and creativity. If further research were to shed more light into the matter, it may be conceivable that early detection protocols could be developed so that people at high risk of developing bipolar disorders could protect themselves and limit their risk of actually developing the disease.